The Tibet Center and Gere Foundation present one of the world's great spiritual leaders and author of The New York Times bestsellers An Open Heart and The Art of Happiness. In Cultivating Compassion, The Dalai Lama explores the three levels of understanding. Understanding derived through listening or study, understanding derived through reception and thinking, and understanding derived through meditation and practice. Through meditation, we can generate genuine compassion and by clearing away attachment and aversion, we can better practice compassion in our daily life. The message in this is great but it is difficult to understand and tested my patience. 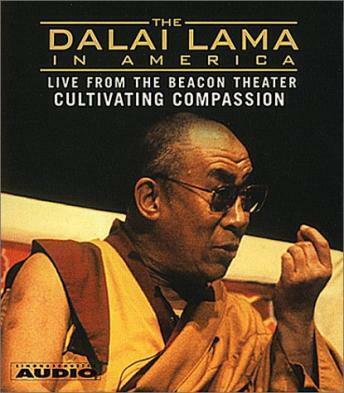 The live recording makes it difficult to understand the Dali Lama and he speakes in a mixture of English and Tibetan. The words are immediately translated but I found it difficult to listen to several minutes of an unfamilair language. I felt as if I missed the message he way trying to convey. I found this audiobook rather disappointing. I have tremendous respect for the Dalai Lama and what he has to say. I just finished listening to The Art of Happiness at Work and found that to be extremely worthwhile. On this audiobook, however, I found the recording got in the way of my listening. You should realize that most of this is taken from a workshop at which the Dalai Lama spoke. For much of the recording, someone asks a question, the Dalai Lama answers for 60-90 seconds in Tibetan, and then someone translates. I really don't need to hear the Tibetan part each time. While it makes it more authentic, I don't have a Fast Forward button on my audio player. In this case, I would have preferred editing over authenticity. Listening to the Dalai Lama live is a real treat. I was fascinated by the translator who took long segments of lecture before giving the English meaning. However, we have here a true man from the unknown, and something of this rubs off in the listening. The chanting that ends the tape is surprising in its power. The first thing to know about this audiobook is that it is a recording of a live session and that the Dalai Lama does not speak English. His words are translated surprisingly quickly, sometimes too quickly, into English by another monk. There are some question and answer periods and parts of another session are referenced though we never quite get the context. All the formating issues aside the wisdom is universal, the ideas provocative and the goal blissful. Listen and take from it what you will.